An extraordinary abundance and richness of natural and cultural heritage has been identified in Lullymore in Co. Kildare. In just a relatively small area of 20,000ha studied, 49 wetlands, 8 rivers, 19 habitats, 109 frog sightings, 3 canals, 3 islands, 27 bridges and aqueducts, 92 birds, 14 historical buildings and 19 tourist attractions are concentrated. Add to this 9 notable people including artists, poets, military heros, film producers and historians and the social character of this area is revealed. It’s no wonder that the area welcomes thousands of visitors each year who enjoy its secrets whether walking on the canal routes, exploring ancient graveyards, discovering the magic of Lodge Bog, the Butterflies at Lullymore, the bluebell walk in Killinthomas woods or taking part in the annual turf cutting competitions. The findings are published in the Atlas of the Natural and Cultural Heritage of Lullymore in Co. Kildare which is available to download on line at here. This includes tables of the natural and cultural heritage and a series of three maps. The maps show the Physical Features, Habitats and Wildlife and Tourist Attractions of Lullymore. There is also a short photographic film tribute to the area entitled “Bog of Allen – Rise of Heritage“. 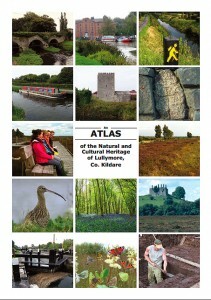 The Atlas is the result of an inventory of the man made and natural heritage features centred on Lullymore in the Bog of Allen region of Counties Kildare and Offaly conducted in 2014. “The richness and variety of the heritage is extraordinary in such a relatively small area and is inspiring local enterprise, providing a substantial income for the local economy through tourism and contributing to rural development” says Dr Catherine O’Connell the chief researcher behind the project. “The Atlas will also be a useful resource helping to inform discssions about community-led land use planning in the area including biodiversity protection and windfarm development” she added. The Atlas of the Natural and Cultural Heritage of Lullymore is the result of a project supported by Kildare County Council under the Community Heritage Grant Scheme 2014. The project aimed to characterise the unique meaning and value of Lullymore to the people who live and work there. The outcome of this process is the Atlas inventory of the natural, cultural and tourist resources of Lullymore. The project is an initiative of the Irish Peatland Conservation Council. The Atlas covers an area of land within 8km of the Bog of Allen Nature Centre or 20,000ha. It extends from the towns of Derrinturn and Carbury in the north, to Rathangan in the south, from Clonulloge in the west to Robertstown in the east in Counties Kildare and Offaly. Most of the land in this area would have been bogland prior to its extensive development for fuel formthe 19th century to the present day – concentrated in Lullymore Bog and Timahoe Bog. Three land “islands occur within the bog complexes that were not swallowed up by the growing boglands – Lullymore, Lullybeg and Derrybrennan. This entry was posted in News and tagged Attraction, Bogs, Conservation, experience, Family Nature Activities, Heritage Week, Ireland, Nature Trail, Places to Go, Things to Do, Visitors. Bookmark the permalink.